When seeking to evoke any type of myth, there is one very important aspect that should be borne in mind: myths tend to express absolute values. It’s the coherence of those values that can give myth its power, its ability to shape our world-view, at least in those moments when we’re immersed in a tale. Two such absolute values in The Four Branches are honour and her reflection, shame: both motivate important events, ultimately shaping the actions of the characters. In the imagined world of the tales, such values are as hard and pervasive as any natural law. 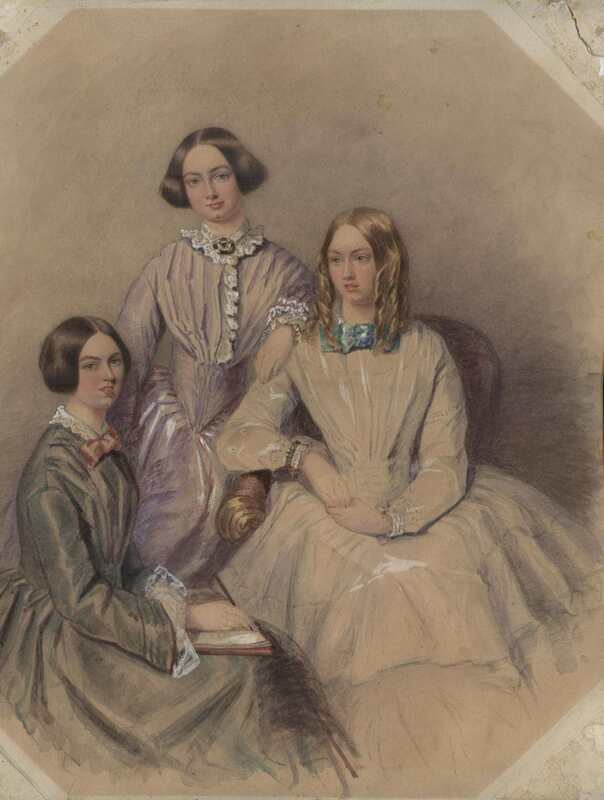 Honour and shame compel different responses in The Four Branches: compassion in Rhiannon as she acknowledges her midwives’ shame; grief in Branwen for the tragic war that arose out of her shaming and subsequent attempts to restore her to honour. Likewise, over-sensitivity to honour and shame causes destructive fury in Efnysien, and a lack of sensitivity to the very same values causes a callous folly in Gwydion. These are all very varied responses to the constants of honour and shame. Lady Godiva by John Collier (1897), another medieval female embodiment of honour and shame. If we take The Four Branches as our model, our tale should be founded upon similar absolute values. These absolutes will provide the true north of the mythic landscape, the direction by which all other directions are known. Absolutes point the way along the pilgrims path that characters either progress upon or are turned away from. Fundamentally, these absolutes rest upon a sense of the sacred. They can only be absolute if they are treated as sacrosanct within the world-view of the tale. They can never truly be violated or undermined, only deferred or delayed. They exert a pull upon all who live in the tale’s imagined world, pervading the common understanding of the characters, their intuitions and behaviour. Even though such absolutes are fundamentally impersonal in nature, they affect the personal lives of good and bad alike. Just as Lady Justice is blindfolded, these apparent ‘natural laws’ don’t see personal circumstance, they simply operate without discrimination. They are presented as perpetually imminent, woven into the fabric of a tale’s world, yet almost exclusively expressed through individual lives. jDISCLAIMER: Before going any further, some of you may ask why I’m writing about authors, seeing as I’m not someone who writes novels. I’ve never attempted to write a novel or even a short story. Apart from a few articles in journals, I’ve never published a story in my life. But there is at least one really good bunch of stories that I can talk about: The Four Branches of the Mabinogi. Amongst other things, these stories are unique for their particukar skill and craft; in them we can see the mechanics of symbolic narrative and how myth works. This series of posts is simply another way of talking about myths and how we use them. Please don’t read this as advice on how to write a novel. For that, please ask a novelist, someone who’s actually done it.. So, how does that happen exatly? How do you construct a narrative that has the potential to evoke a mythic response? Notice I’m only claiming potential here. There is no real certainty that you can evoke a mythic response in an audience, fundamentally because myth is something that happens within the audience’s experience, not within a text. The only thing an author can do is try their best to understand the audience they wish to create for, to uncover what gives their lives meaning. An author could begin by asking what is their chosen audience’s general culture? What do they believe in? For this series of posts, lets assume the chosen audience is interested in what we might call deep ecology. On a mundane level they are environmentally aware, support sustainability and respect nature. On a deeper level they believe that human consciousness should, in a perfect world, be deeply embedded in nature. Within this particular culture, these values make up a myth often referred to simply as The Land. 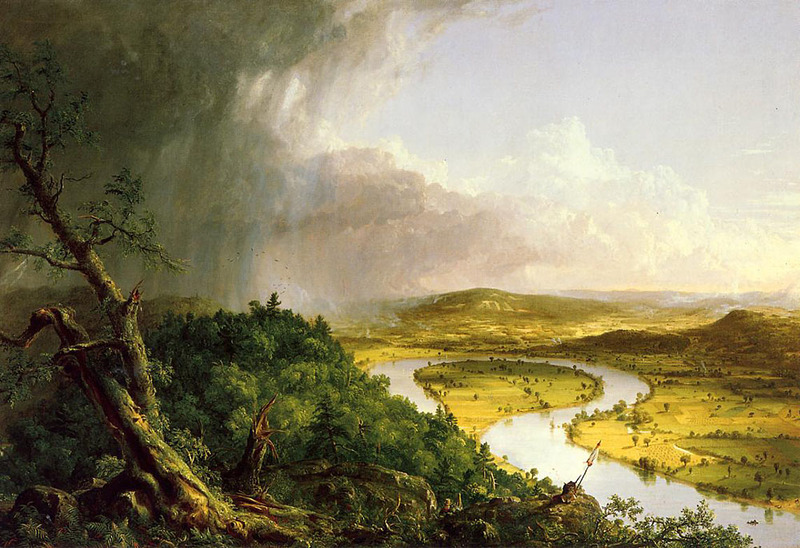 Thomas Cole, The Oxbow, (1836). The Land is a myth that draws on some very old cultural strands, often pagan in orientation, and mostly delivered to our age through 19th century Romanticism. Today, this myth expresses a yearning for connection with something felt to be lost in modern culture: a nativeness, a wildness, an honouring of an ancient human perspective that sees itself as part of Sublime Nature, not above or separate from it. The Land often has an Eden-like quality. It’s the Promised Land we modern humans have left behind, yet can perhaps still return to. But to return implies some kind of redemption, and in the myth of The Land, that redemption begins with an acknowledgment of the problem: humanity has apparently divorced itself from natural consciousness. Our consumption-driven culture is self-destructive, creating a society that divorces us from our life-supporting environment, leaving our natural souls to wither in the glare of a dead, technological light. Modern, main-stream consumer culture (which has the same traits all over the planet, East and West) drives us to reject our original, natural humanity. In that sense, The Land expresses an existential crisis, one reinforced by the environmental realities of the modern era. If climate change research shows us anything, we are fast approaching an ecological disaster that threatens life as we know it. In the myth of The Land, this ecological disaster is a symptom of our disconnection from the spiritual ground of our being, the Living Earth. It’s a myth that encompasses not only a crisis in individual, but also in collective existence. So having defined it, how could an author evoke it? The Wind in the Leaves, Part 1. 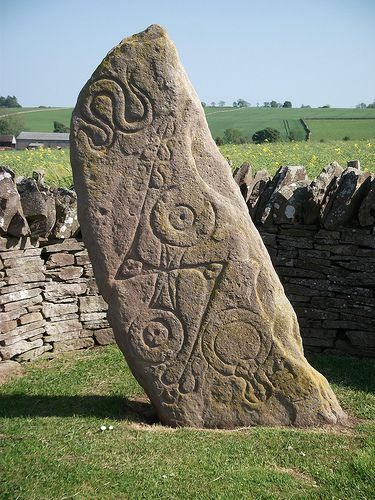 Aberlemno Pictish Stone. Symbols are the bedrock of human culture. What is a myth? That’s a question that rarely stays answered for long. In my own experience, I’ve rarely been able to settle on a single definition of myth that covers all of its many uses. The situation today is more complicated because myth was redefined in some scholarly circles during the 20th century, such as in the work of the French philosopher Roland Barthes (see this post). Myths grow out of our instinctive ability to use symbols, the bedrock of human culture: a marriage ceremony symbolises the promise of fidelity; a religious image symbolises a whole body of beliefs and morals; wearing shiny pieces of cut stone and worked metal symbolise wealth and status; certain letters before a name symbolise gender and relationship, and so on and so on. Myths evoked in literature, in the modern definition at least, are essentially a symbolic use of narrative. 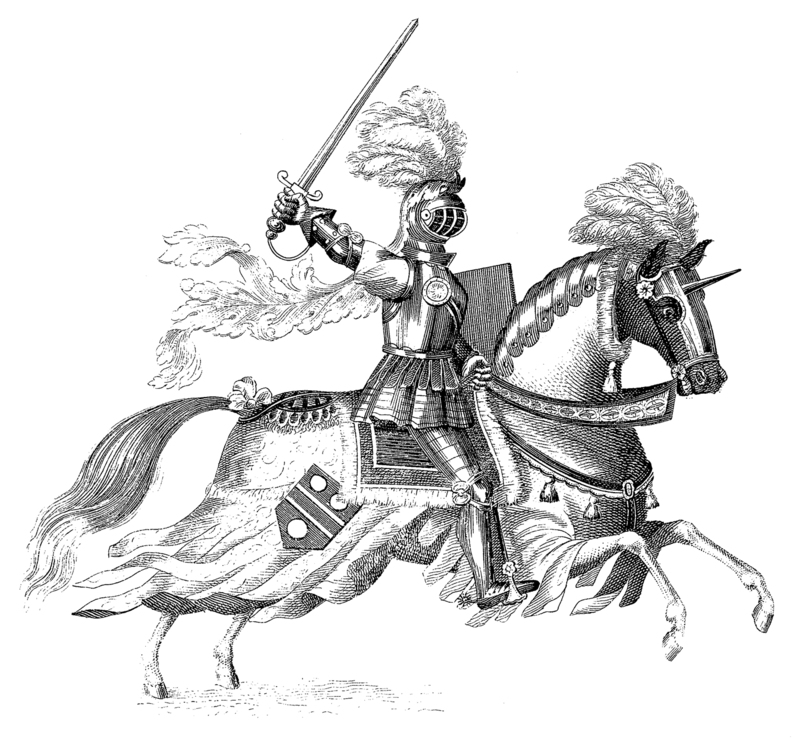 For example, in stereotypical European hero tales, the hero is often a symbol for a traditional code of conduct: men should be brave, chivalrous, defend the weak and put personal honour before all else. This is never explicitly spelled out in the tale, but symbolically suggested by the actions of the hero. Such tales suggest that the values they evoke are part of the natural order of things: there is a perfect type of man; dragons are always bad and should be killed; princesses are always weak and need rescuing; fighting is good and should be done well, etc, etc. All of these things that are suggested, but never literally explained in the tale, evoke a type of myth, in this case the late medieval myth of the European male hero. A knight in shining armour . . .
As is obvious in the above description, myths can also become outdated. As culture evolves, older myths are inevitably challenged and discarded. Myths are considered good or bad or anything in between depending on who you’re talking to. One thing is certain, myths can unify people or serve to separate them just as effectively. Most of us never question how such myths are created nor how they’re used, and experiencing myth is rarely considered a conscious act. We often think of myth as something that happens to us, stories that are told to us, not something we can do ourselves. That’s mainly because we’ve come to think of myth as something outside of ourselves, old stories created in ages long past. But myths aren’t separate from us, they live inside us. Myths in particular arise out of our deeply instinctive ability to use and understand symbolic meaning. In the modern definition, myths aren’t stories. They’re certainly closely related, but only in as much as myths use stories. As with the male hero being a symbol for a code of conduct, myth is what lies below the surface of a narrative. It’s a deeper meaning that, if we accept without question the values it expresses, can influence our attitudes. That is essentially the mechanism by which both advertising and propaganda work. But we can also try to approach myth consciously, paying attention to how it’s evoked, what kind of assumptions permeate the tale’s imagined world. So we have a choice, we can either be used by myths – become an unconscious conduit through which they are spread, or we can try and see them for what they are, and how we respond to them. The more we seek to interpret myths, the quicker we discover that not all stories are worthy of our attention. Some stories just aren’t intentionally symbolic, while others strive to be. This focus on symbolic meaning is, after all what identifies mythic stories. Because of this, such tales draw on an archetypal depth in culture. It’s for this reason we can say that a story itself doesn’t contain myth, but that myth arises out of an audience’s engagement with a story. The storyteller’s job is to encourage that process, not hinder it.